Three squad cars, sirens blaring, zoomed down my block Monday night. Police from PSA 5, the precinct that covers public housing in East Harlem, often fly down the street in both marked and unmarked cars. Sometimes they drive the wrong way against traffic. But I hadn't seen three cop cars, speeding in a line with their lights on, since the shooting death of police officer Randolph Holder last year. Holder, an eight-year veteran based out of PSA 5, was shot in the face just two blocks away. Since then the police and city officials have been setting their sights on residents of the housing projects in the area: East River, Jefferson, Johnson and Wagner Houses. The cars turned the corner and screeched up towards 124th street. I walked over to where several cop cars were parked on the sidewalk, expecting to see a crime scene. Instead I saw a standoff between cops and residents, some of whom were furious with the police. 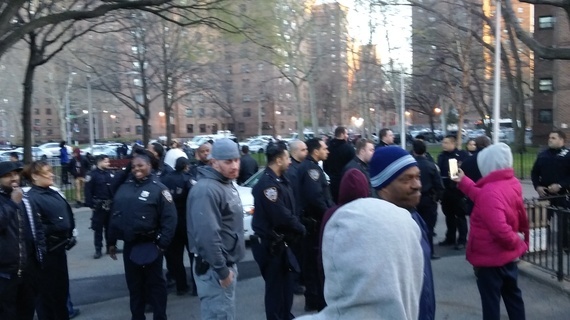 There were close to 50 cops there, from plainclothes to community affairs. They were on the opposite side of about 60 or 70 people, mostly young people. One young man told me that the cops had shut down the filming of a music video that they were recording in memory of Juwan "Chico" Tavarez, a 16-year-old boy who had been shot in the head just a few days prior. People were upset and yelled at the cops, saying they were "only showing love" for their friend. Nearby a shrine of pictures and candles had been assembled by the door of the building where the teen lived. Chico, as he was known to his friends and neighbors, lived at the Wagner Houses. He survived the initial shooting only to succumb to his injuries a few days later. 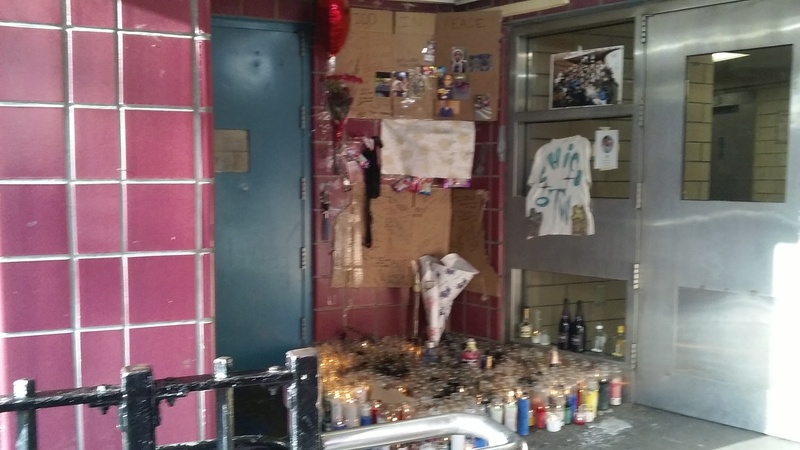 Some have said he was shot in connection with a longstanding beef between Wagner and the Jefferson Houses, the housing project closest to where he had been shot last Friday on 115th street and 3rd avenue. The circumstances in fact mirrors violence that plagued the west side of Harlem. There it was a decades-old rivalry between the Grant and Manhattanville Houses that had led to bloodshed. 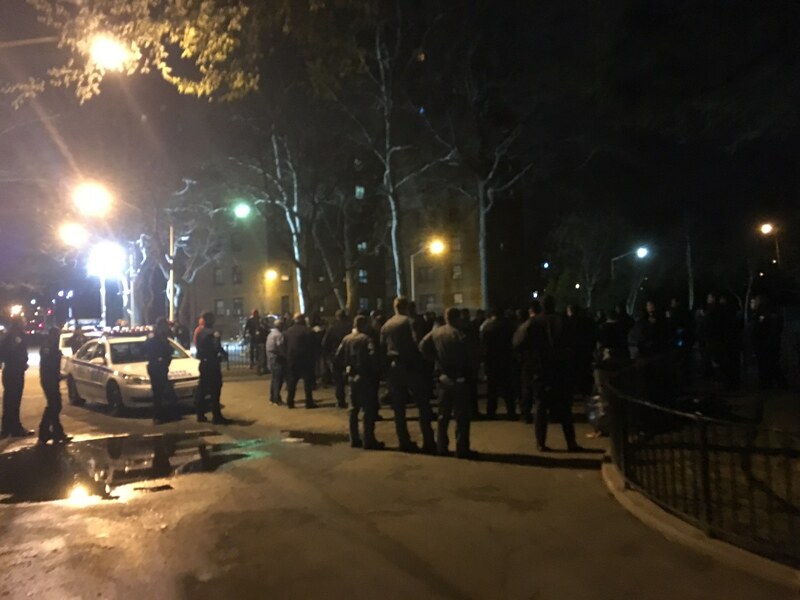 On Tuesday, the tension at Wagner with police continued as cops once again came out in numbers for the 2nd consecutive night. At about 7 p.m. there was another standoff, this time with younger women railing at the police. Two men had apparently been arrested for refusing to leave the courtyard that faced the entrance to the building where the shrine, now double in size, was set up. Dozens of police officers stood around. One officer approached a young man who argued that he didn't have to leave. The cop walked right up to his face before a young woman jumped in between with her phone, recording the cop. An older resident tried to calm the kids down. "You can't make us leave our own home. We have to inside because you say so? ", another young woman yelled out. "WE live here!" Copwatch Patrol Unit was out filming the police on both days and says the community was angered by the police presence, which they described as "intimidation". CPU's Jose LaSalle, who has family that lives in the Tavarez family's building, says police have been posted inside the lobby and that is one of the things inflaming tensions with the younger residents. Steve Cruz, who has copwatched in East Harlem housing projects for years (and has ample video of police interactions), says the cops have always been aggressive with NYCHA residents. He obtained cellphone footage of the arrests of the two young men Tuesday. After the shooting of Holder, reportedly by someone who lived in the East River housing projects, the situation is perhaps at a boiling point. But to not allow residents to congregate in front of the building, which has benches and playgrounds there specifically for the purposes of people being able to hang out in the front, makes little sense--especially if they're mourning the loss of one of their friends. That sort of frustration, in fact, could easily escalate a situation that many think will undoubtedly lead to a violent retaliation against residents of the Jefferson Houses. Police are likely adding fuel to the fire. At a trial for a young man who was charged in connection with violence from the Grant and Manhattanville feud, prosecutors have tried to use Facebook posts and photos to paint a picture of a gangbanger. Families from Grant and Manhattanville have objected to the dragnet-like arrests of some of the young men. But one detective on the stand on this trial shed light on how the NYPD would closely monitor young residents both electronically and on the streets. One point of suspicion for police, he said, was anyone in the neighborhood who wore necklaces with the photo of Tayshana "Chicken" Murphy, a high school basketball phenom who was shot and killed in stairway of the Grant Houses on September 11th, 2011. All this week I've seen young people in this neighborhood walk around wearing pictures of Chico Tavarez around their necks. In my son's 6th grade class, 11-year-old kids talk about him and wear his photo. Perhaps all of these kids fall under suspicion as well. If so then the police presence in the Wagner Houses this week may not even be the half of what the NYPD is planning. On June 4th, 2014 over 100 young men and boys were indicted after an early morning gang raid, New York City's largest-ever, was launched at Grant, Manhattanville and a few surround buildings in West Harlem. Two years prior, East Harlem's Taft, Johnson Lehman Houses saw 62 young men arrested in a raid that resulted in a case that was a first for the Manhattan DA's office. If another gang raid is in the works, it's unlikely to help a situation where young people are surrounded by violence, poverty and police surveillance. In fact, it's just part of a cycle that keeps unfolding on both ends of Harlem.